National Fetes du Musique day and night here in France. 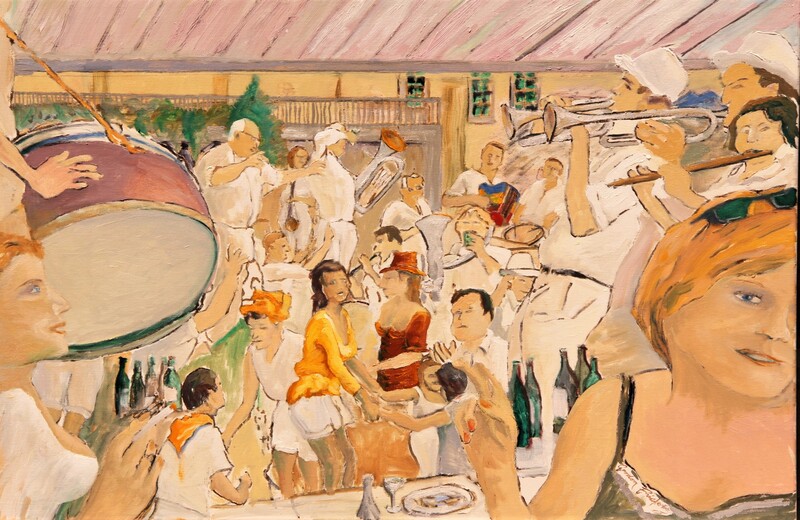 Every town and many villages have a day for music, some like Antibes take 3 days to party. Did you know France has a government department devoted to “quality of life”. The music fest is one of their ideas in action. Can you imaging the British government, Tory or Labour ever having a department like that? This unfinished painting, measuring 61 x 915 cm (24″ x 36″), oils, available. An attempt in progress to convey something of one of the most spontaneous, craziest afternoons I’ve enjoyed, one of the most spontaneous craziest, most amicable afternoons I’ve bee fortunate, privileged enjoy ~ and share with you here. The Fete du Vin at Sauveterre-de-Guyenne, Gironde. My plan is to keep this ‘impossible’ picture loose, colourful, warm, noisy with a minimum of detail as was the event. The painting should really be accompanied by full volume music.